The bedrooms in our circa 1875 home have always provided a decorating challenge. The rooms are small and there’s lots of angles to consider. 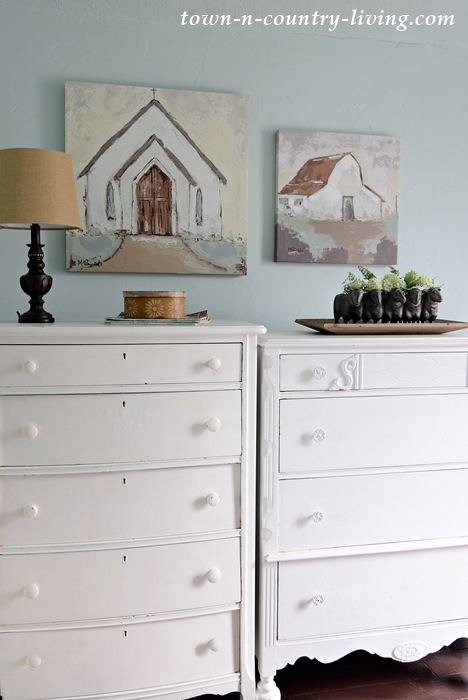 Once furniture arrangement is figured out, you can start to decorate your bedroom for the season – in this case – spring. Since we had a little snow this weekend, I decided to go with a lighter, neutral color scheme for spring. I replaced my cocoa-colored quilt with my ruffled white bedspread. A cozy dusty pink throw adds a little warmth since winter has decided to stick around for a few more days. 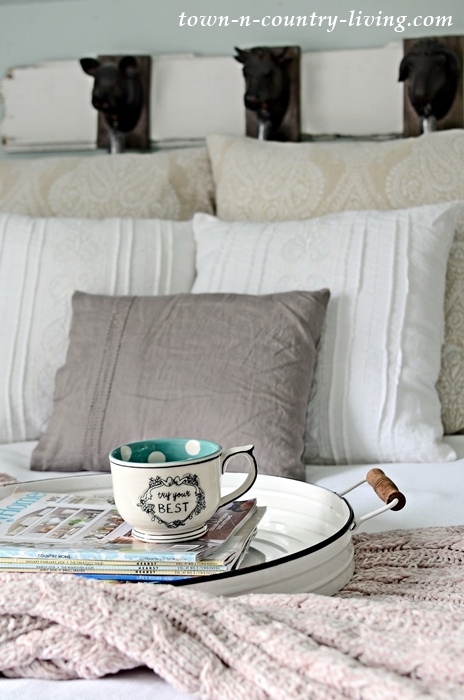 A linen pillow pairs with white embroidered cotton pillows to keep things light. 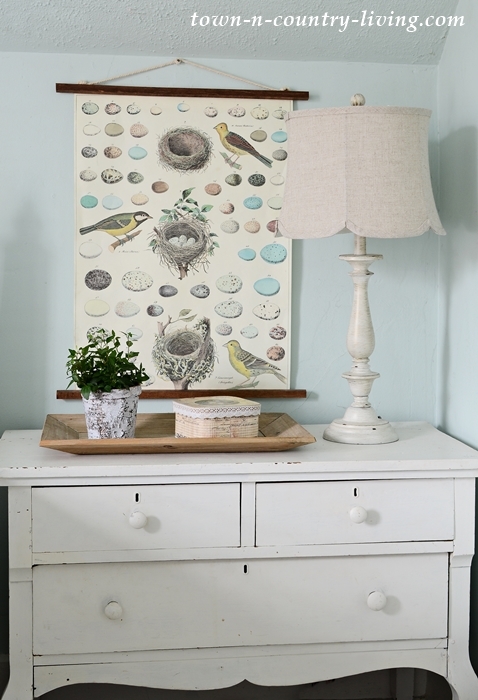 A spring bird poster replaces the cow oil canvas that used to hang above the nightstand. When I decided to decorate the bedroom for spring, I chose not to add anything new. I simply shopped the house to create a fresh look. 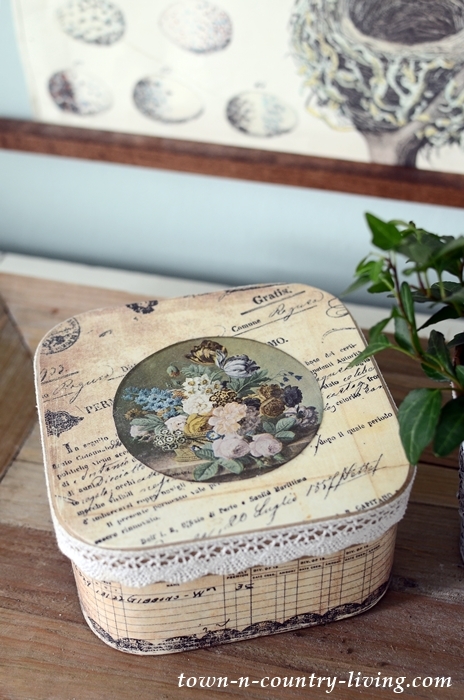 Several years ago I made decoupage boxes. I had forgotten about them until Woman’s World magazine asked if they could feature them in an upcoming issue. They make perfect containers for bedside items like Tums or aspirin – things you might need in the middle of the night for an upset stomach or headache. 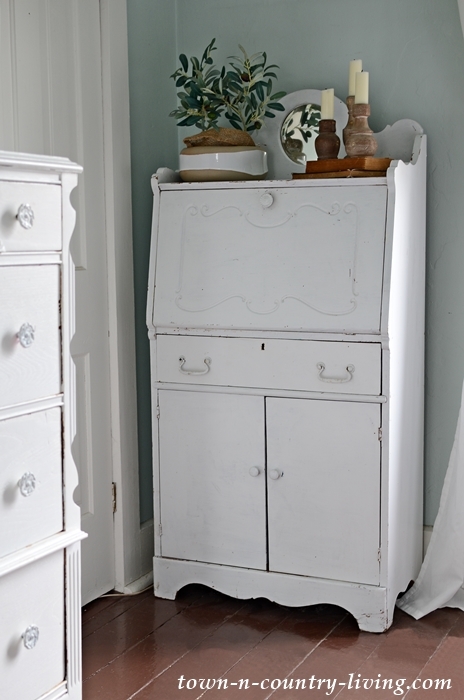 Over the years I collected a pair of vintage white dressers. I hate to part with them so I pushed them together to act as a single dresser. One day I’ll give them to one of my daughters and will replace them with a single dresser. But until then, they’re staying like this. 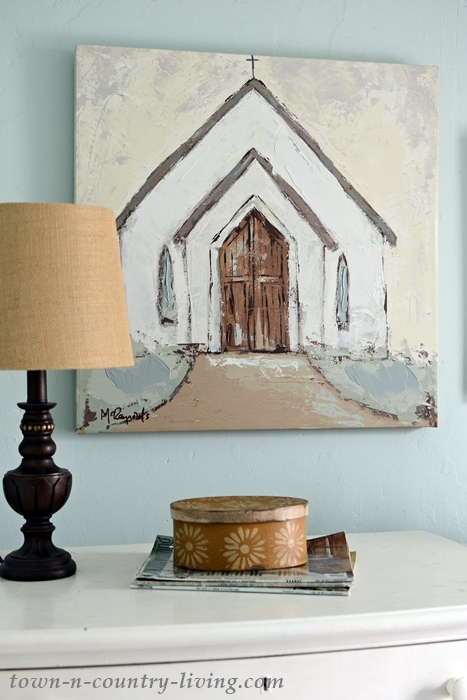 Last year I found a pretty canvas painting of a country church at Kirklands. And not much later I found the barn canvas from the same artist. 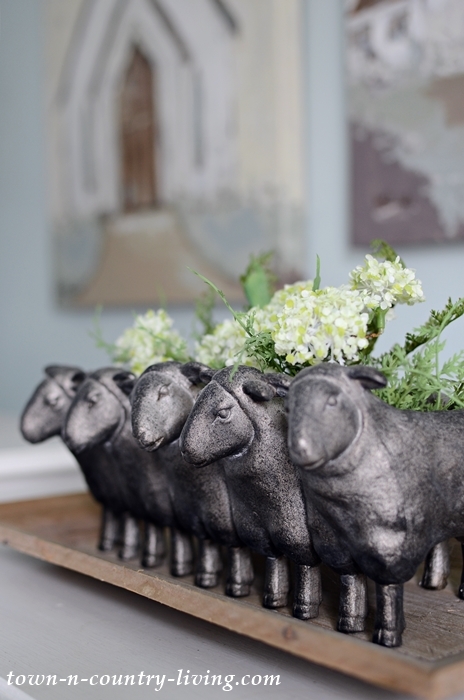 The sheep planter gets moved around from room to room. The white secretary still holds crafting supplies. It used to live in the entryway before I reworked that space to fit with the dining room. White curtains replace the tan ones that matched my winter quilt. I love the airy appeal they provide for spring. 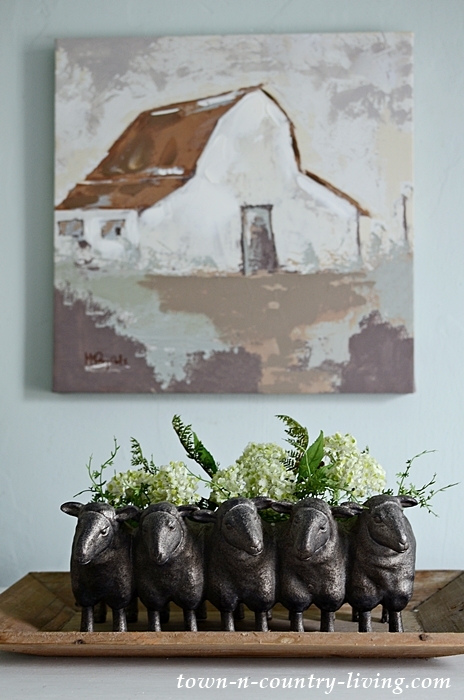 A white tobacco basket replaces the natural one that used to hang here, and I added a lavender plant. Lavender is said to relax and calm your nerves. When you decorate your bedroom without buying anything new, all you can do is try your best and re-work some of your favorite items. When summer comes, the bedroom will get a bit of fun color. I think I’m going to paint the walls a new color, too. Do you decorate your bedrooms for the seasons? 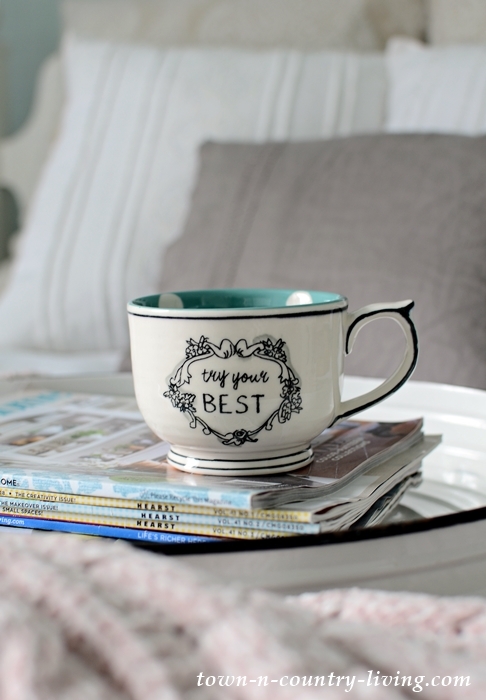 Is Shabby Chic Style in Style? I love how your room turned out…really lovely and so inviting. Love the piece over your bed. Did you buy it or did you make it? Doesn’t really matter because it’s adorable and I would love to have one if you could share the information please. I have had country French in my home for years but I’ve just chanced our bedroom into more farmhouse decor and that piece would be perfect in there. Thank you and have a wonderful day. Hi Suzanne! I kind of made the piece above the bed. It’s just an old barn board that I painted white. Then I hung the little animal heads onto the board. Every once in a while I swap out what hangs on the barn board to give a different look. I think I found the animal heads at Antique Farm House – but I’m sure you could find something similar elsewhere too. Your bedroom looks amazing and so relaxing and calm. I used to use heavier draperies in my bedroom in the fall and winter, then change them out for lighter sheers for Spring and Summer, but I realized one year that I liked the amount of light and watercolor feel that they provided even in the winter, when everything seems so dull – so they stayed. I do warm up the room in the winter with heavier bedspreads, pillows and throws, then change out the look for warmer weather, but the sheer draperies in the winter remind me that light and warmth will come again. After hanging the lighter curtains, I had the same experience as you! I really felt like the room felt happier and brighter with the somewhat opaque light curtains. Like you, I don’t think I’ll be adding heavy ones come winter time. Where can I find that ruffled white bedspread? Thank you, Nan! I found the bedspread at Home Goods. They constantly rotate their stock so it’s kind of hit or miss. You just have to keep checking. I love your Spring room and and those old pieces of furniture, they have such beautiful curves. 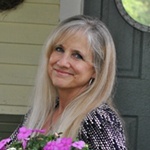 I like your pictures, my favorite is the old barn i have a few of those and the animals are so cute. I love everything! 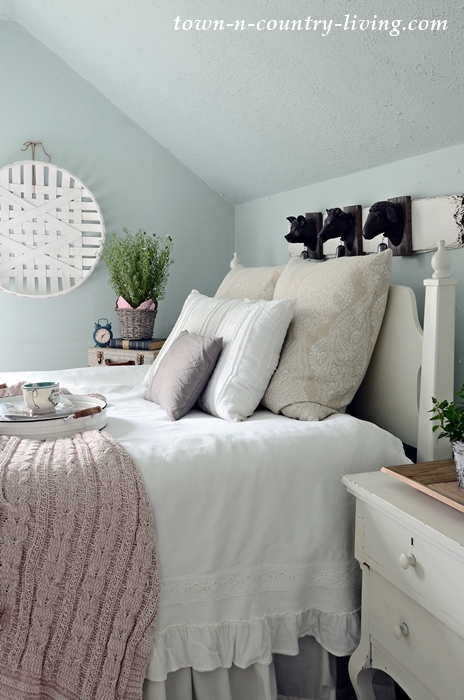 I never thought about decorating my bedroom for spring. 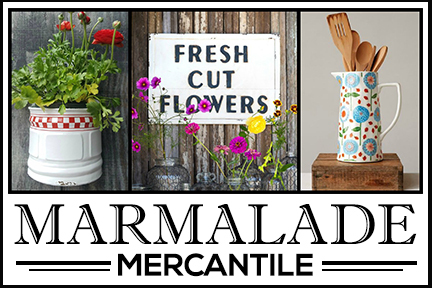 But I am excited to be getting 2 new sign paintings from Hobby Lobby very soon in the mail. Thanks Pamela! So exciting to be getting some goodies from Hobby Lobby! I recently found several pieces of wall decor that I had to bring home. Lucky, everything was half price! 🙂 They have nice sign paintings. Your spring bedroom is beautiful! I like to add seasonal touches to my bedroom, but right now I’m still using the flannel sheets with snowmen on them! Maybe next week the weather will be warmer and I can try out something new! 🙂 Thanks for the inspiration! Hi Judy! I hope your weather gets better soon so you can replace the snowmen sheets! 🙂 Our weather in Illinois is just now starting to turn! This is an excellent post you share here. 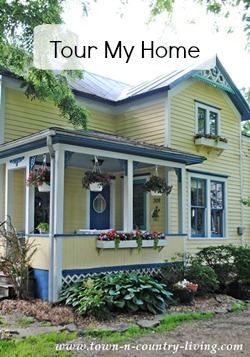 I love your spring home decoration ideas. 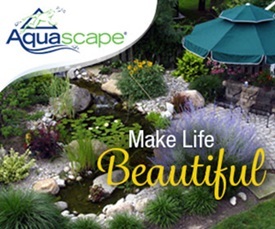 All your decorative ideas are awesome and unique. Thank you for sharing this post. Keep sharing new decoration ideas with us. I love that blue wall color! What is it and where can I find it!!? Unfortunately, I don’t remember the color of the bedroom paint. I’ve had a few people ask me, too. I’m sorry!